It's Friday! Thank God, right! Well since today is the first day of a new month, I thought I would share with you my monthly goals. I have been making a list of monthly goals for a while now and have really enjoyed it. I usually write them down on a piece of paper (decorated of course) and hang them up on my cork-board. The goals I make are usually fun/easy but sometime I throw in some more challenging ones. I like making a monthly goal list because it keeps me on my toes and gives me something to improve on or works towards. This months goals are relatively easy. Spend less time on the computer- This is something that I have been trying to work on (haha). For those of you who may not know, I take some of my college classes online. So I with school, blogging, facebook and pinterest, I spend more than my fair share on the computer. Work on more craft projects- Right now, my sketch book is filled with ideas for new projects. I just need to get off the computer and make them. Work on writing ideas- I have always had the urge to write a book, either a novel or a craft book. In my sketch book I have beginnings of stories written down, that I need to explore or at least organize. I also have ideas for a craft book but I'm still not sure about the whole thing. Complete 2 goals from 21 before 21 list- Thats a little self explanatory. But you can check out my list here! Clean bookshelf- This is one of those things that I have been putting off but need to do. Work on future goals- Right now I'm trying to come up with goals for my etsy shop, school and a whole bunch of other things. It one of those times where you need to sit down and re-think some things. 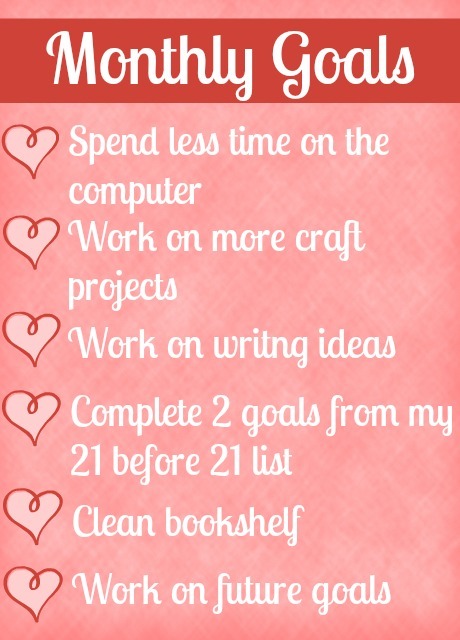 So those are my goals for the month! Do any of you guys write down monthly goals? What a great idea! I need to write one too. I think it's great to have a list to make sure you keep on track and focus on a few goals at a time. I hope you manage to start your book! Good luck!